Monday night’s Tippecanoe Valley School Board meeting saw several groups and organizations within the corporation receive recognition for recent accomplishments. 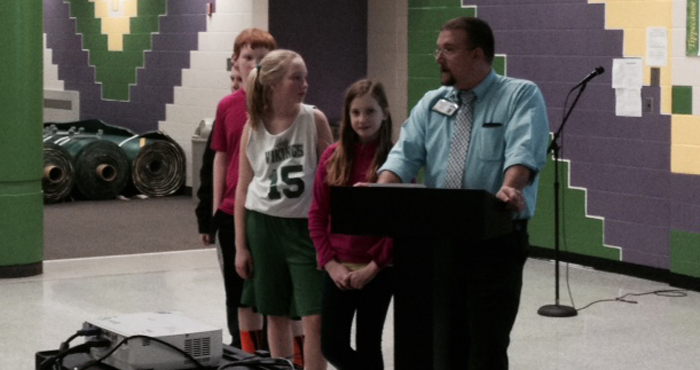 Tippecanoe Valley Middle School Principal Scott Backus introduced members of the school’s spell bowl team, which won the conference championship. Backus stated that members of the team had to learn how to spell over 1,600 different words in order to compete. TVMS student Billy Gillman made it all the way to the finals of the Kosciusko County Spelling Bee, finishing as the event’s runner-up. Several members of the team were on hand for the meeting. The TVMS seventh grade football team was also recognized for an undefeated season. The team only let two opponents score on them the entire year and was named conference champions after beating North Miami Middle School in the championship game. The board approved the hiring of Jessica Creekmore to the position of TVMS nurse. The hiring now ensures that there will be at least one nurse on school premises at all times during the academic week. The board approved a revision that moved the “items from visitors” segment of the school board meetings from sixth on the docket up to third in order to allow those who attend the meeting to voice a comment or concern the ability to say their piece early on and not have to wait for the duration of the meeting. Superintendent Brett Boggs reminded everyone present that suicide prevention speaker Jeff Yalden will be in the area from Monday, Feb. 16, until Wednesday, Feb. 18 (see related).